December 20 2013 – Solar Impulse Pilot, Bertrand Piccard completed the 72 hour non-stop flight simulation begun 3 days earlier in Dübendorf. After André Borschberg in 2012, Bertrand confronted the human challenge of very long flights and drew many lessons in preparation for the first round-the-world solar flight in 2015. To draw all the lessons from this experiment and measure the mental and physical condition of the pilot in real time, a whole battery of tests was performed by the Solar Impulse team in cooperation with experts in every field. Fatigue, cockpit ergonomics, nutrition, use of the toilets, exercises to prevent thrombosis, vigilance and the ability to pilot the aircraft in a state of sleep deprivation were all assessed. "This experiment provided vital training for the round the world flight, while at the same time highlighting the extreme difficulty of this venture." explained Bertrand Piccard (Initiator, Chairman and Pilot of Solar Impulse). Exiting the simulator with a smile he added "Seeing so many doctors around the Solar Impulse reminded me of my first profession, although this time round I was the patient." During the simulation, Bertrand Piccard used self-hypnosis techniques to remain alert, manage his fatigue and sleep. Two of his hypnotherapist colleagues monitored the simulation and helped to answer the many questions put by members of the public on the social networks. Bertrand went into episodes of hypnotic trance to stimulate his activity, fall asleep or wake up faster. Over the 72 hour period, he rested 35 time period of 20 minutes on a seat specially developed by Lantal, a Swiss company which is a technology leader in aircraft seats. The EPFL researchers monitored the pilot’s physiological data using solutions which are habitually reserved for laboratories. The encephalogram and electrocardiogram data will be analyzed and correlated with the outcomes of the vigilance and reaction time tests by the Hirslanden physicians and will play a key role in defining a rest strategy for the pilot during the round the world flight. The personalized dietary strategy developed by Nestlé Health Science has proved appropriate in terms of both nutrition and taste. To respond to the constraints caused by temperature and pressure variations in the cockpit, Nestlé Health Science has developed several different packaging solutions which Bertrand Piccard has been able to test. After this successful response to the challenge, the two pilots can now focus on the final phase of preparation for their round the world flight. 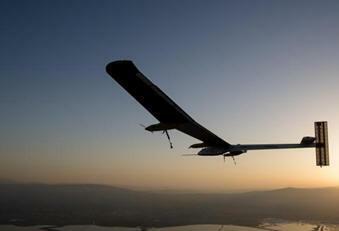 The next 18 months will be a period of intense activity for the Solar Impulse team. Final assembly of the new aircraft in Payerne (VD, Switzerland) will begin in February 2014. The presentation of this second prototype in April will be followed by a program of test flights and training at the aerodrome in Payerne. The aircraft and pilots should be ready to take off on the successive legs of their solar-powered round the world flight beginning in March 2015.